Monteagle village is located 15-minutes north of Young, surrounded by orchards and olive groves. The village is located close to the stunning Tout's Lookout and historic Iandra Castle - open on well publicised days throughout the year. Here Alpacas guard the sheep from foxes. Another 10 minutes on the gravelled Scenic Road brings visitors to Tout’s Lookout for stunning views of the countryside. The nearby Iandra Castle is open on occasion throughout the year. The Castle, in the Elizabethan Style, has a tall tower, 57 rooms and is a very early (1908) example of reinforced concrete. The Monteagle Cemetery is home to rare and valuable remnant of grassy box woodland. It is unusual because like most of the woodlands, it has rarely been grazed by sheep and cattle. Although it is only small (4ha) and many of its trees have been cleared, it has some of the highest quality native understorey remaining in New South Wales. The grassy understorey is dominated by kangaroo grass (Themeda australis) and snow grass (Poa sieberiana), with many native herbs and windflowers growing between the grasses. 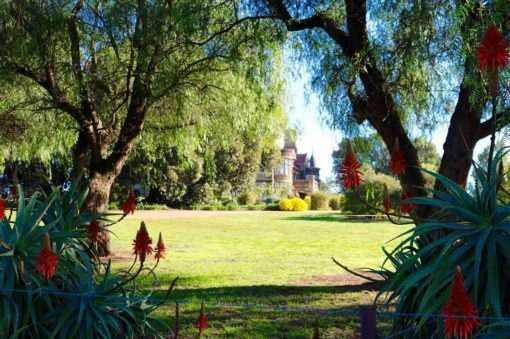 Iandra Castle sits between Grenfell, Cowra & Young. It is a large homestead between the villages of Greenethorpe & Monteagle. Young is the nearest major town to Iandra Castle, which is just 25 minutes north of Young and 15 minutes from Monteagle. The Castle has a state heritage listing. Built between 1908 and 1910 in the Federation Romanesque style by the pioneering engineer Edward Giles Stone. The homestead, with the surrounding agricultural property is a rare example in Australia of the manorial system, "the likes of which may not exist elsewhere in the state or nation". The dwelling along with the surrounding stables, church and residences were listed on the New South Wales State Heritage Register in 2005. The castle has frequent open days, usually around one per month. These normally occur around public holidays. Iandra Castle will also open for groups and coach tours on request.